Sorrisniva has long traditions with snowmobiling, as one of the first provider in Norway. Explore the nature of northern Norway while their experienced guides will give you a safe experience on the snowmobile. 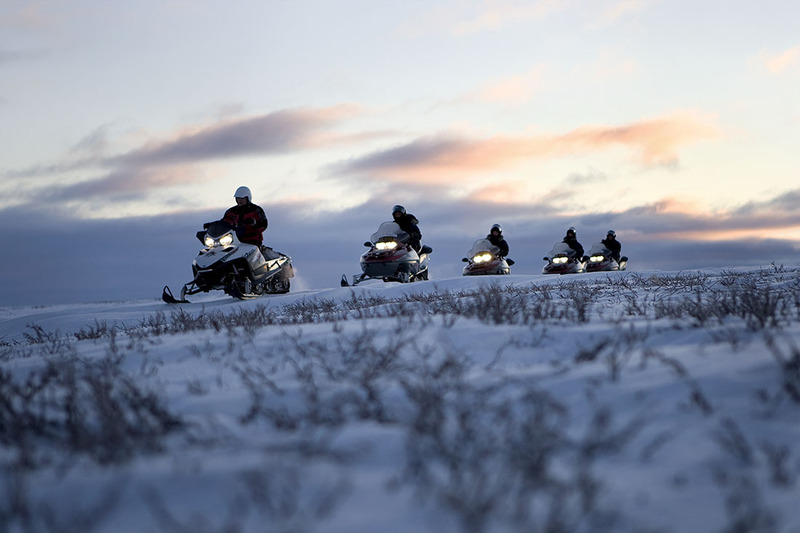 Sorrisniva has long traditions with snowmobiling, as one of the first provider in Norway. Explore the nature of northern Norway while their experienced guides will give you a safe experience on the snowmobile. Experience the arctic light and beautiful scenery of one Europe’s’ last wildernesses with snowmobiles from Sorrisniva through Alta Valley to the Finnmark plateau. This tour will give you the opportunity to experience the Arctic light and nature while driving with snowmobiles from Sorrisniva through the Alta Valley and up to the Finnmark plateau. The sun and the Arctic light vary during the winter season and provide a wonderful light on the horizon. This special light can be seen in a better way once we go up on the Finnmark plateau with its wide, white snow-covered expanse. 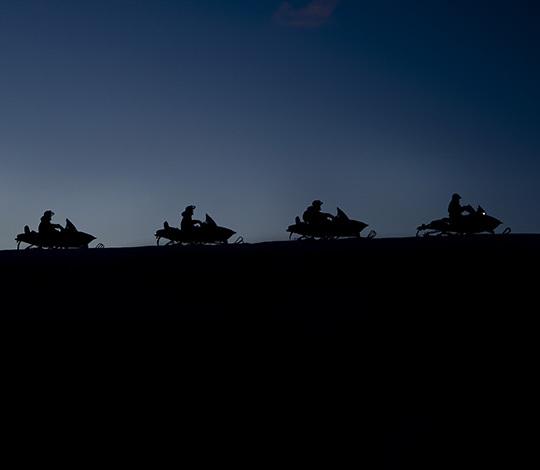 Choose to drive your own snowmobile or share it with a friend. Before the tour starts the guide will give you driving and safety instructions. We start the tour just outside the Igloo Hotel and follow the snowmobile trail through the forest and up to the vast snow covered Finnmark Plateau, one of Europe’s last wilderness areas. We might also see traces from wild animals such as mouse, grouse, fox and lynx. After the tour a visit to Sorrisniva Igloo Hotel the Worlds northernmost ice hotel is included. The guide meets you in the reception at Sorrisniva at 11:30 am. Guide, thermal suit, winter boots, gloves, woolen socks, helmet and gas and oil. Entrance to the Igloo Hotel. Driving license for car or motorcycle is required. The tour can be cancelled due to weather and snow conditions. Transfer must be pre-booked within 24 hours before arrival and is not included in the price. Drive through varied landscape in the forest, over the wide white expanse and over frozen lakes up to the mountain plateau. Feel the thrill driving through varied landscape in the forest, over the wide white expanse and over frozen lakes up to the mountain plateau. Listen to the total silence when stopping on the plateau and experience the ever-changing Arctic light during the winter time. Choose to drive your own snowmobile or share it with a friend. Your guide will meet you in the reception at Sorrisniva and before the tour starts the guide will give you driving and safety instructions. 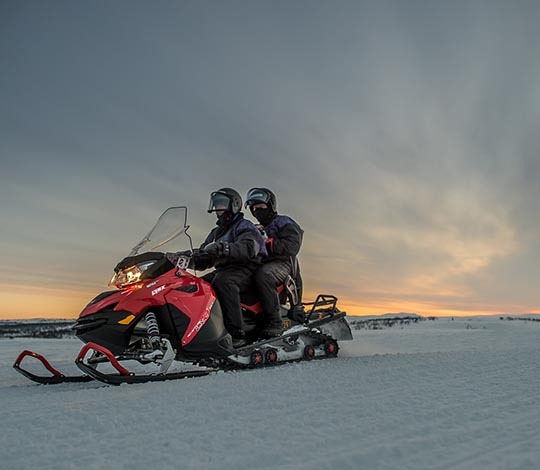 We start the tour just outside the Igloo Hotel and follow the snowmobile trail through the forest and up to the vast snow covered Finnmark Plateau, one of Europe’s last wilderness areas. We might also see traces from wild animals such as mouse, grouse, fox and lynx. The view is magnificent and the thrill of driving such a fun vehicle is exhilarating! The tour takes you to Jotka Mountain lodge for lunch. The lodge is one of the only buildings in Finnmark that wasn’t burnt during World War II. The tour ends back at Sorrisniva at approximately 15:30 pm. If you want you can visit the Igloo Hotel (entrance not included in the price), or enjoy a dinner in our restaurant (pre-booking necessary). Guide, thermal suit, winter boots, gloves, woolen socks, helmet and gas and oil. Warm lunch, coffee and cake. The lunch will be served at Jotka Mountain Lodge, but we reserve the right to change the destinations if necessary due to weather conditions. 1 night in Igloo Hotel in dbl. room, breakfast and morning sauna, guided ice fishing tour with snowmobile, snack and hot beverage. The tour starts from Sorrisniva and ends up at the Finnmark plateau. The guide will take you to the best fishing spot in the area. Hopefully we will catch a trout or the arctic char! Ice fishing is one of our lifelong traditions in the Arctic winter. It is a wonderful and peaceful experience with both the excitement around the fishing and the beautiful scenery on the plateau. Maybe you will see some traces after the wild animals in the area. Our guide will prepare some snack and hot beverage for you during the trip. After the trip, we will head back to Sorrisniva were you will check in at Sorrisniva Igloo Hotel and have a tour around. The rest of the evening you can relax on your own in the main house and in the ice hotel, enjoy dinner in our restaurant (maybe your catch will be on the menu) and join activities. At day two the heated sauna is a perfect start after a good night sleep, before you can enjoy our locally sourced breakfast buffet. The transfer back to Alta city or airport can be booked at 09:45 am or 14:30 pm. Ice fishing at one the best lakes in the area – hopefully you will have a nice catch! Transfer to the Alta city center or Alta airport at 09:45 am or 14:30 pm. Transfer, 1 night at the Igloo Hotel in dbl. room, incl breakfast and morning sauna, guided ice fishing tour with snowmobile (2 persons per snowmobile), snack and hot beverage. Included in the price. Must be pre-booked. One night at the Igloo Hotel in a double room including breakfast and a 2.5 hours Arctic Light Tour by snowmobile. The tour starts with transfer from Alta City Center to Sorrisniva at 17:30 pm. How you spend your evening is up to you, you can relax at the main house or join one of our activities. We can recommend both our Northern Lights tour, and the evening Reindeer and Sami Experience. It’s also possible to have dinner at our restaurant. The menu at our restaurant is based on locally sourced ingredients. In the reception you’ll find maps of the surrounding area showing tracs and paths that you can walk by yourself. Head-torches can be borrowed at the reception. Our Sauna is heated from 07 – 10 am, so on day two you can start the day here before enjoying our locally sourced breakfast buffet. 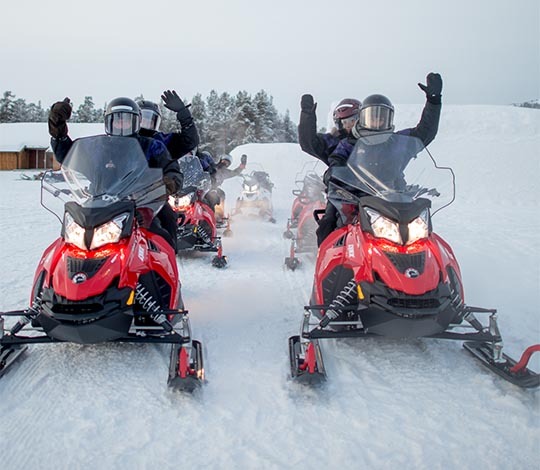 The day continues with a snowmobile tour to the Finnmark Plateau at 11:30 am. The tour is approximately 30 km long and driving and safety instructions will be given before the tour starts. You return to Sorrisniva at 14:00 pm, and you can enjoy lunch at our restaurant before the transfer leaves back to the City Center at 17:00. Spend the evening as you want. See options below. One night at the Igloo Hotel in a double room, including breakfast. Thermal suit, winter boots, warm hat and gloves for the snowmobile tour. Drivers must sign a liability form for activities organized by Sorrisniva. Driving a snowmobile requires a driving licence for car or motorcycle. Sorrisniva reserves the right to cancel the tour based on weather conditions. Allergies must be reported in advance. Two people share one snowmobile. 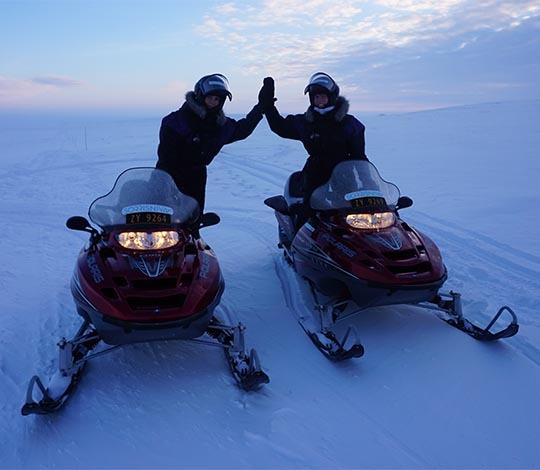 Combinedsnowmobile and ice fishing tour on the Finnmark platea incl. lunch. The tour starts from Sorrisniva and ends up at the Finnmark plateau. The guide will take you to the best fishing spot in the area. Hopefully we will catch a trout or the arctic char! Ice fishing is one of our lifelong traditions in the Arctic winter. It is a wonderful and peaceful experience with both the excitement around the fishing and the beautiful scenery on the plateau. Maybe you will see some traces after the wild animals in the area. Warm lunch and warm drinks are served during the tour. Guide, thermal suit, winter boots, gloves, woolen socks, helmet, gas & oil, warm lunch and beverages. Visit the Igloo hotel at Sorrisniva NOK 200 / NOK 50 for children 3-12 years.